It's the million-dollar question: how do you make the most out of every square metre of space available at your disposal? The architects of the house we're looking at today, Italian firm Valeria Zoia Architetti Associati, seem to have solved that problem. This is not a grand architectural marvel of a house; instead, it speaks volumes with its simplicity, modern design and unassuming facade. By sticking to a neutral palette inside and out and by making it an open-plan design with unobtrusive furniture, the architects have managed to create a functional home that is modern yet retains a few traditional touches. If you're looking to be inspired by smartly-designed spaces, read on to find out more! Surrounded by greenery on all sides, the first word that pops up when you get your first glimpse of this house is simplicity, one that is achieved by stripping away the layers. 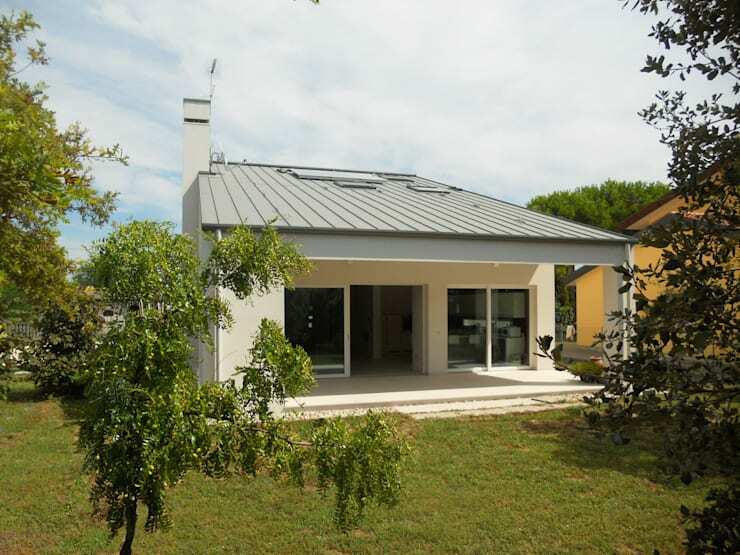 The cream-coloured walls and zinc-coated roof provides a balanced contrast with the natural surroundings. There is a clear boundary between the outside and inside created by a suitably spacious porch. Modern home design usually incorporates a lot of glass and that can be seen here too. Not only do the large glass sliding doors create a fluid boundary between the courtyard and the interiors, it floods the latter with natural light. One of the tried and tested methods of creating a feeling of more space is to opt for a lighter palette. 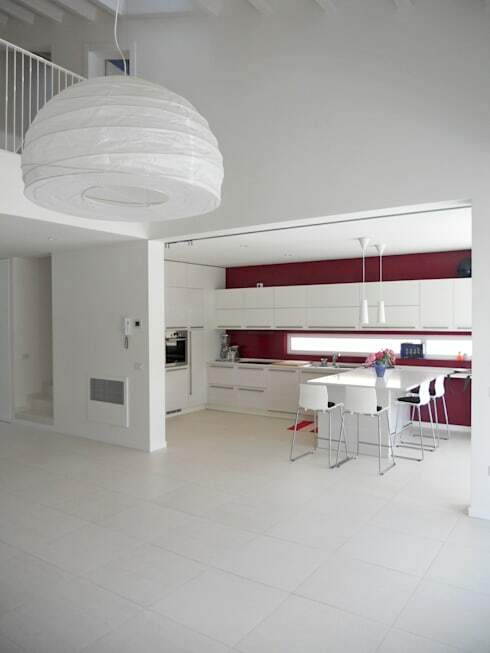 In this case, the architects chose white, which immediately opens up the space and makes it a lot more visually pleasing. While even the lamps and the kitchen cabinetry have been kept white, a bright pop of colour—a deep red—guides you to the kitchen. It's easy to fall for the trap of choosing a purely utilitarian kitchen when you're confronted with small spaces, but small strokes can make a ton of difference. If you're looking for advice, our kitchen experts will be able to guide you along. 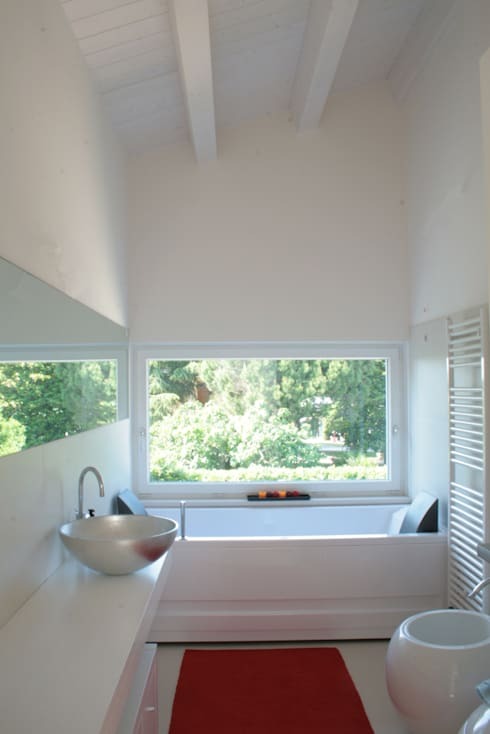 Tiny, compact bathrooms can be a challenge to work with, but there are clever solutions to make the most out of it. The architects here have opted for a clean, fresh approach with straight lines and minimal clutter. Ultra-modern fixtures, an end-to-end wall mirror and storage space immediately make a contemporary statement. By sticking to a neutral tones and by including nature in the design (note the wall-to-wall glass window), the spa-like atmosphere is immediately achieved. Using too much white in the interiors does run the risk of creating a sterile atmosphere, but here that has been avoided by creating wooden beams that have simply been painted a faded white. 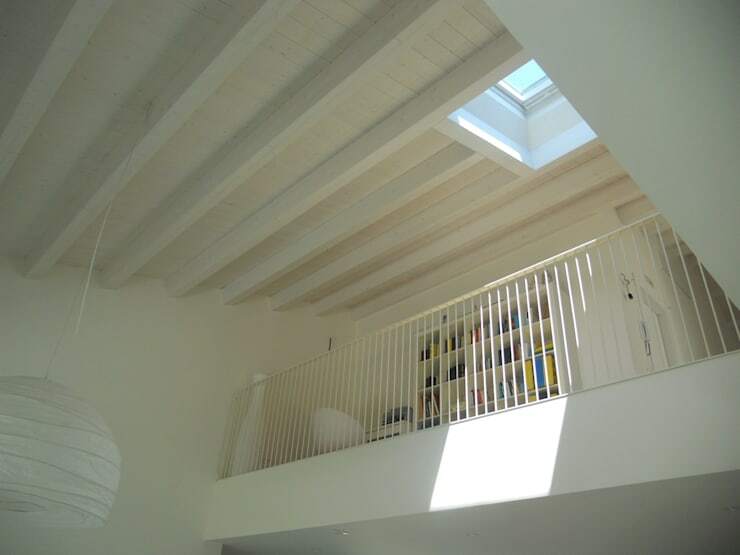 The beams also serve as the traditional touch to an otherwise out-and-out modern home. The view here is from the living room where one can look up to the mezzanine, a smart choice when you're struggling with space as it still allows for a lot of breathing space under the roof. Note the skylight, which throws interesting patterns of light into the living space. The mezzanine is another challenging space to work with. Very often, you're not quite sure what to do with it. Do you turn into a tiny bedroom? Or a storage space? The architects here found a middle ground and simply designed for the study to be in there. 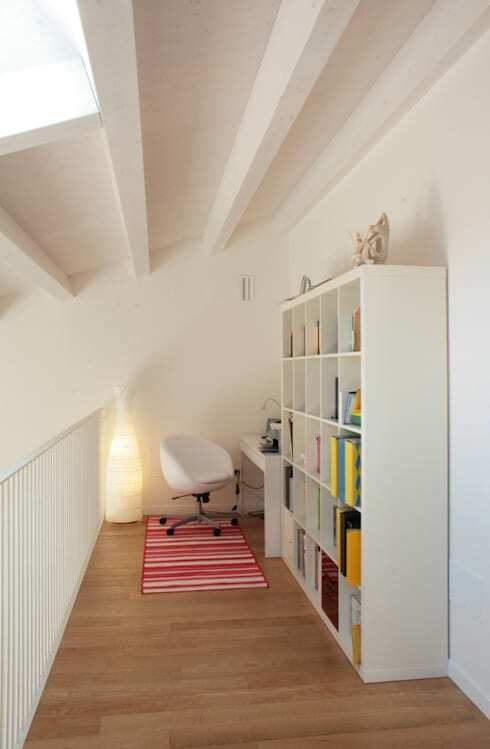 It's a lovely nook, one that affords enough privacy while being able to make your presence felt downstairs. Throw in an ergonomic chair (or two), a study table and an organised bookshelf—and there you have it. In the mood for more inspiration? We suggest you check out: A modular home for the extended family. What did you think of this minimalistic design? Let us know in the comments below!